How do I enter data into SPSS for a 1-way between subjects ANOVA? Home > How do I enter data into SPSS for a 1-way between subjects ANOVA? I’m going to use this example to help you understand how to enter the data. Suppose you want to study the effect of sugar (IV) on memory for words (DV). 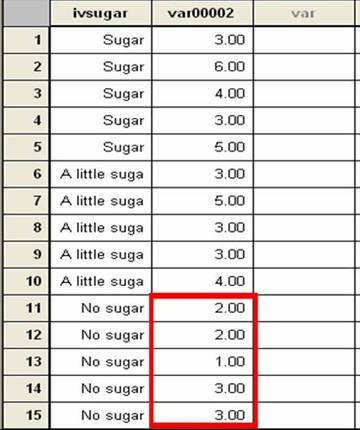 You have three groups (also called conditions) in your experiment, sugar, a little sugar and no sugar. Each participant only participates in one condition of the experiment. Participants in the first condition are not related in any way to participants in the second condition or third condition. Because the participants in each condition are not related in any way, we will use the 1-Way Between Subjects ANOVA. Here are the data. 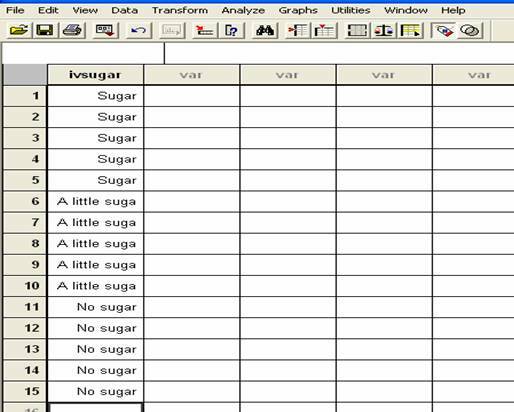 In this experiment, you want to know if there is a significant different between the data collected from each condition, sugar, a little sugar and no sugar. You want to know if sugar really does have an effect on memory for words. Does word memory significantly increase or decrease when people eat sugar? Is there no difference in word memory for sugar and no sugar conditions? Just looking at the data, you can probably see that there is a difference in word memory between the three conditions. You can probably see that word memory in the sugar condition appears to be much better than word memory in the no sugar condition. Word Memory in the a little sugar condition also appears to be better than that in the no sugar condition. People generally appear to remember more words when they have eaten sugar. So you might be wondering, why can’t I just look at the data? Why do I have to conduct this t-test? The reason is that we are not just trying to figure out if there is a difference in words recalled between each group. We want to know if there is a statistically significant difference. That is, a real difference as defined by statistics. The ANOVA will be able to tell us that. 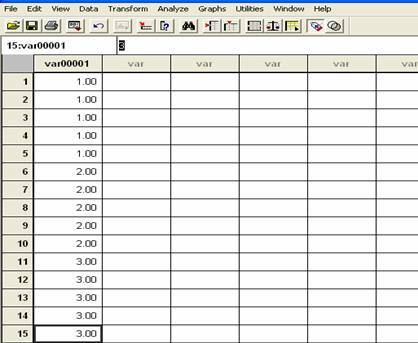 You will use the first two columns of your SPSS data file to enter the data for the 1-Way Between Subjects ANOVA. In this column, you should type in three different numbers to represent each of your three conditions. For example, you could use the numbers 1, 2 and 3 to represent your three conditions. The 1s could be used to represent the sugar condition and the 2s could be used to represent the a little sugar condition. The 3s could be used to represent the no sugar condition. Take a look at what I’m talking about below. You can see one column of data with 1s, 2s and 3s. There are five 1s. They will represent data from the five participants in the first condition, sugar. Below the 1s are five 2s. They will represent data from the five participants in the second condition, a little sugar. There are also five 3s. They will represent the data from the five participants in the third condition, no sugar. The number of 1s, 2s and 3s that you use will vary, depending on how many participants you have in each condition. Double click on the top of the first column to name it. 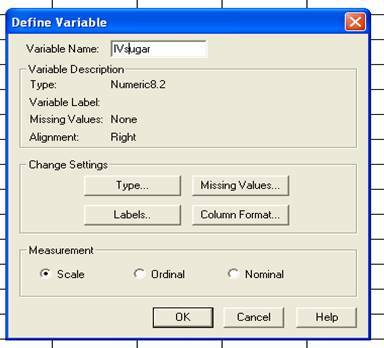 The Define Variable box will pop up and you can enter a new name for the variable in the Variable Name area. Give the column a meaningful name. This will make your life a lot easier when you analyze the data and interpret the results. Because this column represents the three conditions of the IV, it is a good idea to use the letters “IV” in the name of the variable. You might also want to include a word that describes what is being manipulated. 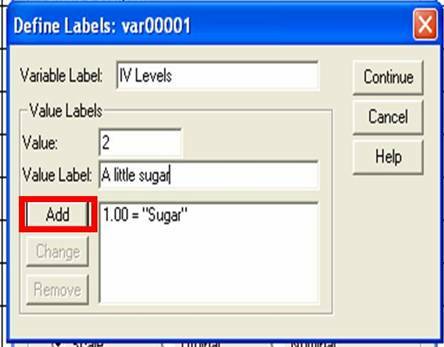 In the below example, I decided to name my variable “IVsugar.” I decided on this name because this variable is an IV in which the presence of sugar is being manipulated. Hold off on clicking OK when finished. We are going to do something else with the Define Variable box before we close it. Life would be a lot easier if the numbers 1, 2 and 3 in the first column of the data file had meaningful names. While we can’t type in meaningful names directly into the data file, we can convert these numbers to meaningful names. 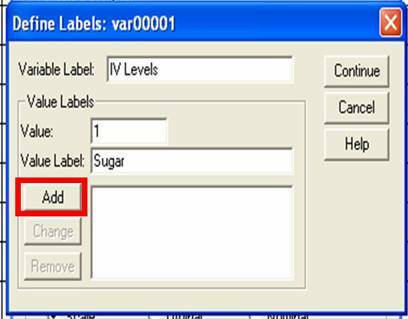 To do this, click on the Labels button in the Define Variable box. 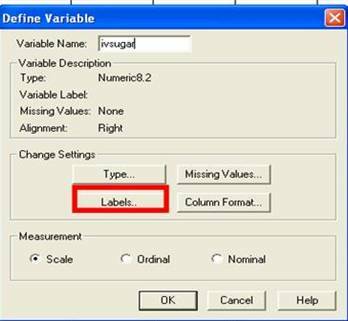 A Define Labels box will appear. You will see three blanks that will be important to fill in. 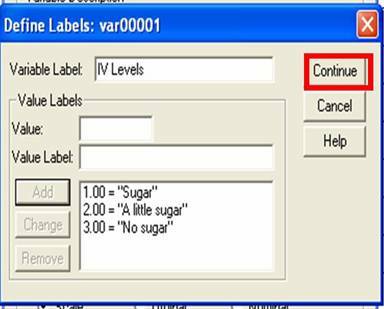 In the Variable Label box, enter the word “IV levels.” In the Value box, enter the number 1. This number represents the first condition of your experiment. In the Value Label box, enter a meaningful name for the first condition of your experiment. 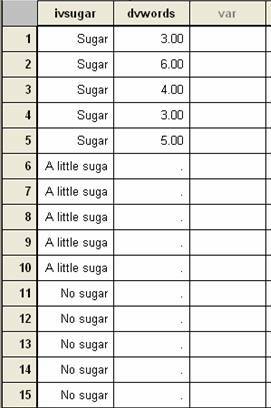 In this example, I have chosen the word “Sugar” to name the first condition. Click the Add button when you are finished. Now that you have entered information for condition 1, continue with condition 2. Do nothing with the Variable Label box. Type the number 2 into the Value box. Type a meaningful name for condition 2 in the Value Label box. In my example, I chose the name “A little sugar” to represent my second condition. When you are finished, click the Add button. Similar to before, do nothing with the Variable Label box. Enter a number 3 in the Value box to represent the third condition. Enter a meaningful name for the third condition into the Value Label box. 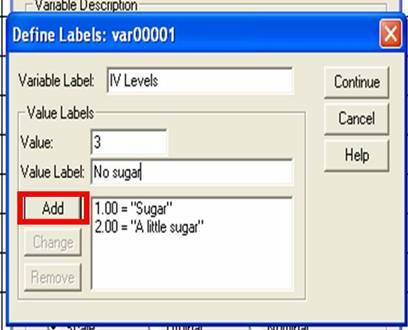 In this example, I chose the name “No sugar” to represent by third condition. Click the Add button when you are finished. You will see all three condition number and names appear in the bottom window of this box. Each condition name is paired with a corresponding number in the data file. Click the Continue button when you are finished. You will return to the Define Variable box. Simply click OK to exit. Check out your data file. Look’s a little different from the last time that you saw it. Now, instead of seeing the numbers 1, 2 and 3 in the first column, you will see the words that represent each of these conditions. You may think that this was an awful lot of steps to take, just to get to the end result of seeing your conditions labeled in the data file. Actually, you will benefit in the future from labeling your conditions here. These labels will also appear in your results file. They will make your results much easier to interpret. 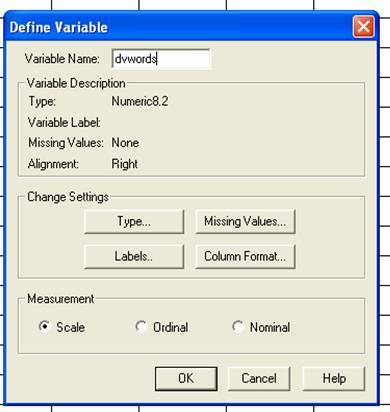 Note that if you have completed all of the previous steps but do not see the words instead of the numbers, you are probably working on an older version of SPSS. That’s ok. Just continue. While your conditions won’t be named in the data file, they will be named in the results file and you will benefit from that. In this column, you should type in the actual data collected for each participant in each condition. In the example, each data point represented the number of words remembered. 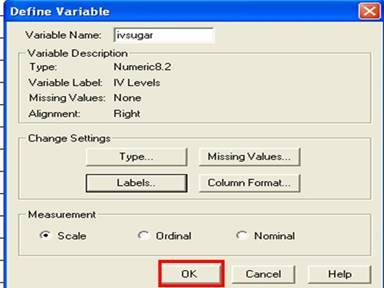 Start by entering the data from the first condition of your experiment into the second column of the data file. In this example the first condition was sugar. 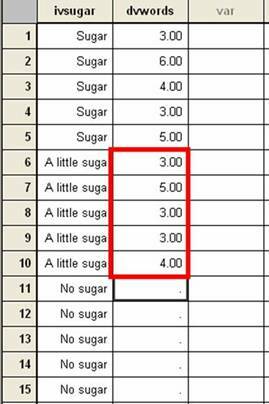 Each data point from the sugar condition should be typed next to the word Sugar from the first column. See the number 3 in the first row. That 3 represents three words that the first participant in the Sugar condition remembered. When you are finished entering the data from the first condition, continue on by entering the data from the second condition. It’s easy to enter the data in the right spot because we have the condition names in the first column. See that 3 next to the first “A little sugar” label? That represents the number of words remembered by participant 1 in the “A little sugar” condition. Finally, enter the data from the third condition of your experiment. See that 2 next to the first “No Sugar” label? That represents the number of words remembered by participant 1 in the “No Sugar” condition. Double click on the top of the second column to name it. 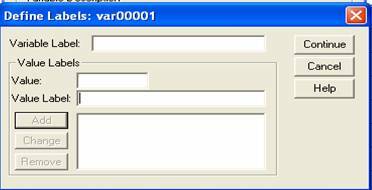 Enter a name into the variable name box. The second column represents your DV. Because of this, it’s a good idea to include the letters “DV” in the name of the second column. It is also a good idea to include the name of what is being measured. Since words are being measured in this example, I decided to name my variable “dvwords.” Click OK when you are finished. But don’t forget to save the data file to a meaningful place with a meaningful name. 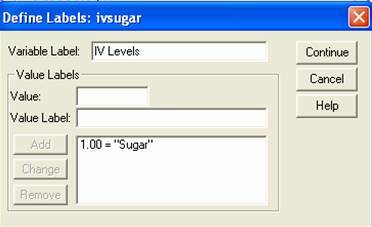 I decided to name my data file “Effect of Various Amounts of Sugar on Words Remembered Data.sav.” It’s a long name but this file will be very easy for me to identify in the future. See how I used the word “Data” in the name? This will help me to know that this is my data file in the future, as compared to my output file which might have a similar name.